November 11, 2014 – Three-quarters of Canadians who watch Hockey Night in Canada (HNIC) say Ron MacLean’s reduced role on the iconic show has hurt the Hockey Night in Canada brand, while two-in-five say George Stroumboulopoulos is a credible replacement as main host. Those are among the findings of an Angus Reid Institute (ARI) survey measuring Canadian opinion on the program, and on the role of hockey in Canadian society and culture. The survey results appear to re-affirm the primacy of hockey on Canadian culture and identity: one-in-ten say the sport “defines” our sense of who we are in this country and seven-in-ten say it is an “important part of Canadian culture”, along with other things. When asked specifically about the National Hockey League (NHL), the vast majority (78%) said NHL hockey is either important or very important to Canadian culture and identity. Respondents also told the Angus Reid Institute about how important NHL hockey was to them personally. Ten per cent identified themselves as “diehard fans”. A further quarter (25%) say they are fans. Of note, one-in-seven men identify themselves as “diehard fans” while another two-in-seven say they are fans. Support for the league’s game is also strong among Canadians under the age of 55; 37 per cent of respondents aged 18-34 say they are diehard fans or fans, as do 38 per cent of respondents aged 35-54. The survey also gauged how Canadians who watch HNIC are feeling about the change in hosts and format in the wake of a significant shift in broadcast rights from the CBC to Rogers Communications in a 12-year, $5.2 billion deal with the NHL. The new broadcast debuted at the beginning of the hockey season, featuring George Stroumboulopoulos as the new main host, with reduced roles for former hosts and commentators Ron MacLean and Don Cherry. When asked about the difference between broadcasts, most viewers (49%) said the show was different but “nothing major”; 37 per cent said they had noticed a “big difference”. Canadians are also split on preference for the old and new broadcasts, with 45 per cent saying they liked the old CBC broadcast better. This sentiment rises to half (50%) among self-identified hockey fans and even higher (55%) among those who say they are “die-hard” fans. Respondents give Rogers Sportsnet the edge on the issue of balanced coverage of teams. When asked about this issue in regards to the old CBC broadcast, two-thirds of respondents, (65%) and about as many die-hard fans (62%) said the public broadcaster had been properly balanced in its coverage of all Canadian NHL teams. One-third (35%) of respondents and 38 per cent of die-hard fans said the CBC had been too focused on teams in Ontario and Quebec. When asked about Rogers Sportsnet’s performance on these measures, perception of balanced coverage of all Canadian NHL teams increases ten points to 75 per cent among respondents who watch HNIC, rising to 82 per cent among die-hard fans. One-quarter (25%) of respondents and 18 per cent of die-hard fans feel the Rogers Sportsnet broadcast is too focused on teams in Ontario and Quebec. It is of note that twice as many die-hard fans felt this way about the CBC broadcast than they do now about the Rogers Sportsnet show. When asked their opinions about the new broadcast and its use of new and former hosts, fewer than ten per cent (8%) feel hosts Stroumboulopoulos, MacLean and Cherry’s chemistry is “clicking together”, while less than one-third (27%) say they have “no chemistry”. Notably, Canadian viewers do appear prepared to give the on-air team some time to find their groove, with two-thirds (65%) saying the chemistry is “coming along”. The survey results indicate the viewing public is missing Ron MacLean. 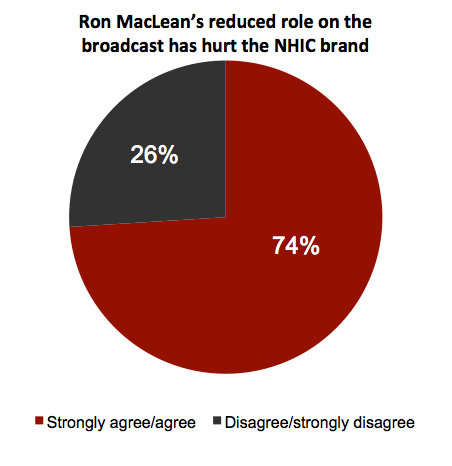 Three-quarters (74%) of those watching HNIC this season agree that MacLean’s reduced role on the broadcast has hurt the show’s brand. When asked about how much they are see him during the broadcast, 48 per cent say “too little” and 45 per cent say “the right amount” (dropping to 34 per cent among die-hard fans). Only seven per cent say they are seeing MacLean “too much”. The decision to have Stroumboulopoulos – a well-known talk show host with an established interest in hockey – helm the new broadcast was a calculated risk for Rogers Communications, aimed in part at attracting a younger viewing audience. It would appear existing viewers are still adjusting to the change. Three-in-five (60%) respondents do not see Stroumboulopoulos as a credible replacement for MacLean as the main host of HNIC. Only eight per cent of viewers say they’re seeing “too little” of Stroumboulopoulos, compared to two-in-five (41%) who say they’re seeing him “too much”. Half of respondents feel his airtime is “just right”. Cherry, the long-time host of Coach’s Corner, took to the airwaves last weekend to complain about the lack of time allotted for his analysis under the new broadcast format. Both Cherry and MacLean have seen their overall roles and airtime reduced from the old CBC broadcasts. In spite of less airtime, when respondents were asked how they felt about how much or how little they have been seeing Cherry since the season began, 38 per cent said, “the right amount”, while about as many (36%) said, “too little”. One-quarter (26%) said, “too much”. The survey also asked French-speaking viewers in Quebec how they are feeling about the change in broadcast from RDS to TVA Sports. One third of viewers overall reported noticing a “big difference” between the broadcasts – rising to two-thirds (63%) among die-hard fans. Quebecers are also getting used to the new broadcast, with 36 per cent saying they like the TVA format less than the old RDS show. Again, this opinion rises to two-thirds among self-identified “die-hard” fans in Quebec.